Attend KIDZ BOP Make Some Noise Tour or The Children’s Palace Holiday Bazaar. Learn about amphibians at Manasquan Reservoir Environmental Center’s Fascinating World of Amphibians event, make apple cider at Great Swamp Outdoor Education Center, or enjoy different cuisines at St. Anthony’s Orthodox Church Festival. If we missed an awesome local event in New Jersey this weekend, please share below in the comments. Be sure to use #njmom when sharing pictures on social media to be featured on our Facebook and Instagram page! Enjoy an exciting afternoon of storytelling dances for all ages, including Honor Among Thieves and Wizard’s Garden by Madeline Cantor. Following the performance, youth audience members meet the performers for photo opportunities on the red carpet, and juice and cookies! Learn the amazing apple’s place in history, as locally grown apples are pressed to make sweet cider right before your eyes. Take part in the hands-on process by helping to prepare and grind the apples, turn the old-fashioned press, and collect the cider. Discover that you have been looking at apples upside down your entire life, that the apple may not have been so American, and many more interesting facts. This engaging experience is topped off with a delicious sample of fresh, homemade cider. Arrive early, admission is based upon first-come, first-served, and demonstrations fill up quickly. Bring your little ones dressed as their favorite Princess or Superhero! Meet and take photos with Princess Jasmine & Princess Belle along with Batman, Spiderman & Superman. There will be lots of great entertainment for the kids and SHOPPING for the Adults! There will also be a raffle fundraiser supporting Justin n Jason journey X2. The Tristate African Violet Council will present its 57th annual African Violet show and plant sale. The theme is “Into the Woods with Violets”. The sale will include plants in bloom, plantlets, leaves and other gesneriads. Stop by for a day of fun! 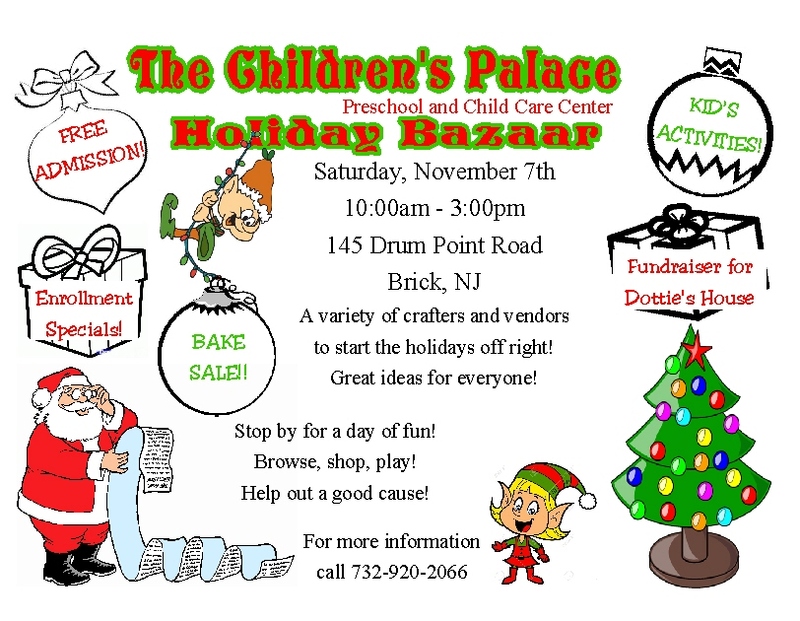 There will be a variety of crafters and vendors to start the holidays off right! Milk & Cookies is a lively, interactive series featuring storytelling, music, puppetry, and more. Recommended for children ages 3-8 and their families. Milk & Cookies invites young people to discover the joy of watching, listening, and interacting with the arts. Free milk and cookies are distributed to children after the events (while supplies last). Created by New York’s Big Apple Circus especially for children on the autism spectrum, this performance features world-class artists and acts, with incredible feats of juggling, balancing, plate spinning, aerial acts, and of course, the Ringmaster! A shorter show length and carefully modulated sound and lighting make the program welcoming to all groups with children with autism. Additional accommodations include a calming center, space throughout the building for standing and moving around, and specially-trained ushers and volunteers for support. Plantapalooza provides children with an opportunity to spend time outside exploring and learning in a fun and exciting way! Through games, crafts, stories and hikes children will learn about how animals and plants are getting ready for the upcoming winter. These talented young performers—Ashlynn, Bredia, Grant, and Matt—sing on the best-selling KIDZ BOP albums. They will be performing some of today’s top songs! Get ready for an exotic adventure. There will be live entertainment and children activities that everyone can enjoy! This annual event has been described as “a parade that stands still!” Imagine dump trucks, fire trucks, ambulances, police cars, military jeeps, and lots more, over 40 vehicles all in one place – parked so kids of all ages can get a close-up look! The atmosphere is relaxed, pressure-free and noncommercial. Learn about the fascinating world of amphibians. See various species of amphibians while learning different calls that these beautiful creatures make. Cape May transforms into a jazz village as fans and musicians make their way to the little town by the sea to witness first-rate performances from award winning, critically acclaimed artists, exciting new artists on the scene, and local favorites. Visitors can sample the work, fun, and tastes of a circa-1900 apple harvest. They will be invited to use the Farm’s old fashioned presses, peeler-corers, and “stomper-strainers” to help the farmers process apples. The techniques used on the Farm to make apple cider, applesauce and apple pie are healthfully reminiscent of those used a century ago, when people–not motors–powered the cranks, handles and other appliances used to process food. For the hungry, there will be apple pie and other apple treats. Come enjoy the music, shop at our booths, explore food items, and learn about Hinduism in a fun family friendly environment!